You already know that utilizing Cloud applications will enable your business to operate more efficiently, be more adaptable to business change and save money to invest in your core business operations. Did you know that the best Cloud applications will also empower your organization by maturing your business processes and execution? 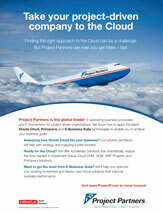 Project Partners is your business outcome focused technology partner for your journey to the Cloud. Our seasoned consultants will help you select the right architecture alternatives to fit your business goals, organization, and technology environment. With the right Cloud solution you will reap the benefits of built-in best practices, evolving your operations and improving business performance. Modern cloud applications from Oracle help you reimagine your business, your practices, and your experiences. The best-of-breed Software as a Service (SaaS) applications in Oracle Cloud are integrated with social, mobile, and analytic capabilities to help you deliver the experiences customers expect, the talent to succeed, and the performance the market demands. Oracle Cloud ERP, PPM, Procurement, HCM and CX applications will help you grow your business smarter, faster, and more reliably without a large upfront investment. Project Partners offers Professional Services Organizations an Accelerated path to the Cloud with our Services Resource Planning solution. This solution is built on industry leading best practices that enable your business to respond quickly to an ever-changing marketplace. Oracle Primavera Cloud applications will also help mature your business and improve your operational and financial performance. We have extensive experience with Oracle Instantis EnterpriseTrack and offer an Oracle approved Accelerate Solution using Instantis for IT Portfolio Management. If yours is a project-driven organization, Project Partners is the right choice as your business and technology partner. We understand your business and have the capabilities to define Cloud strategy, implement, and improve upon existing Oracle Cloud solutions. Starting with your business goals, our team of experienced practitioners will help you determine the best solution and path to success. Project Partners uses Oracle Cloud ERP, PPM and HCM, and Oracle Primavera to run our own business. We have over 25,000 hours of hands-on experience with Oracle Cloud applications and we are proud to have many Oracle Certified Cloud PPM Specialists and Primavera Specialists in our firm. And as the original developers of the Oracle E-Business Suite Projects applications, we know every feature of the E-Business Suite Applications in use today inside project-driven organizations. So we can help you transition to the future without leaving any of your business needs unmet. Whether you want to use some Oracle Cloud applications concurrently with your E-Business Suite environment, or are ready to make a completely fresh start, we have the right skillset to travel this journey with you. 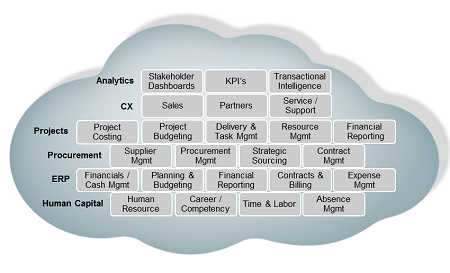 Learn more: Business Applications for Project Based Organizations Overview Video. We look forward to sharing our Oracle Cloud knowledge with you, to help you take advantage of all the benefits these 21st century applications will bring to your project-centric organization. Contact us to discuss your specific implementation and we'll work with you to identify what you can do alone and where we can help.